Spring is here! 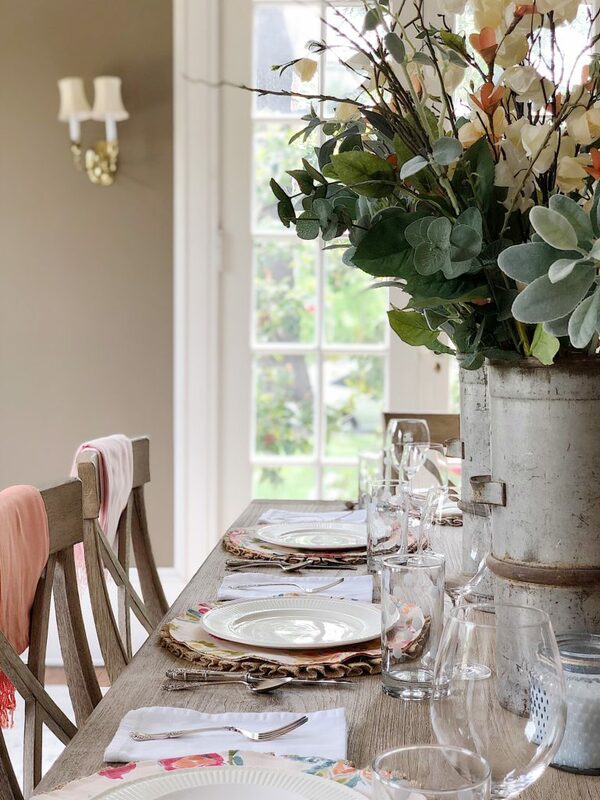 It’s time to talk about spring decor and I have teamed up with five amazing bloggers as we are sharing spring decorating ideas. 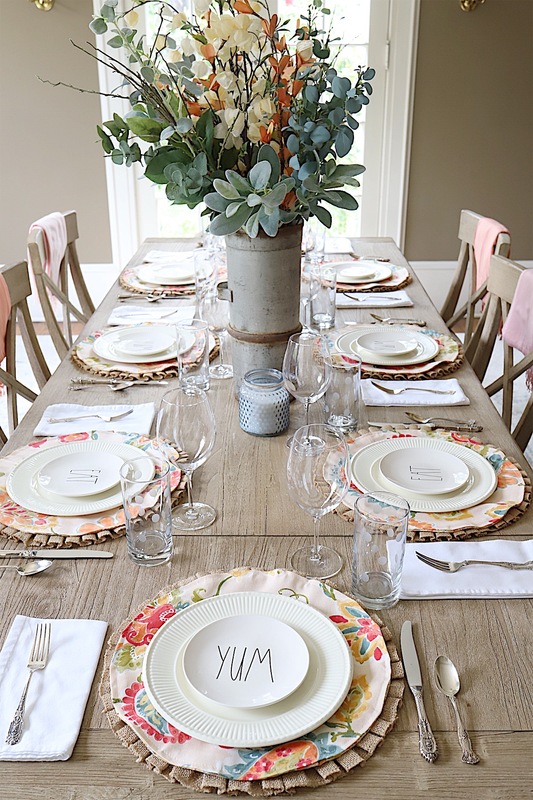 Today I am sharing how I styled my dining room and family room for Spring. Be sure to head to the bottom of this post to see the gorgeous photos of my fellow bloggers. They are Sarah at Dreaming of Homemaking, KariAnne at Thistlewood Farms, Sheila at Maison de Cinq, Ashley at The Handmade Home, and Courtney at French Country Cottage. I decided to go with a peachy/blushy/orangey color palette which is different for me! I was inspired by the paper flowers I have been making in these colors and the fact that these colors work so well in our home. Who would have thought? 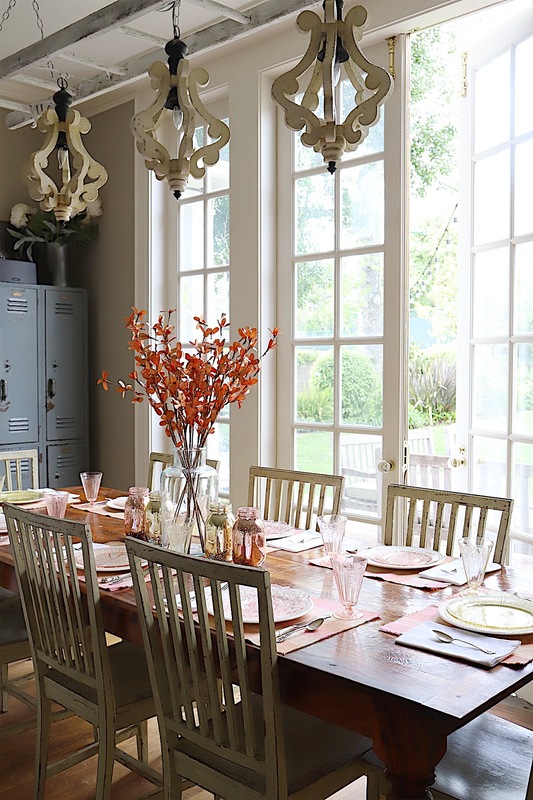 I styled our dining room for a dinner party we are having this weekend. It’s simple yet a bit elegant and I just love the color scheme. 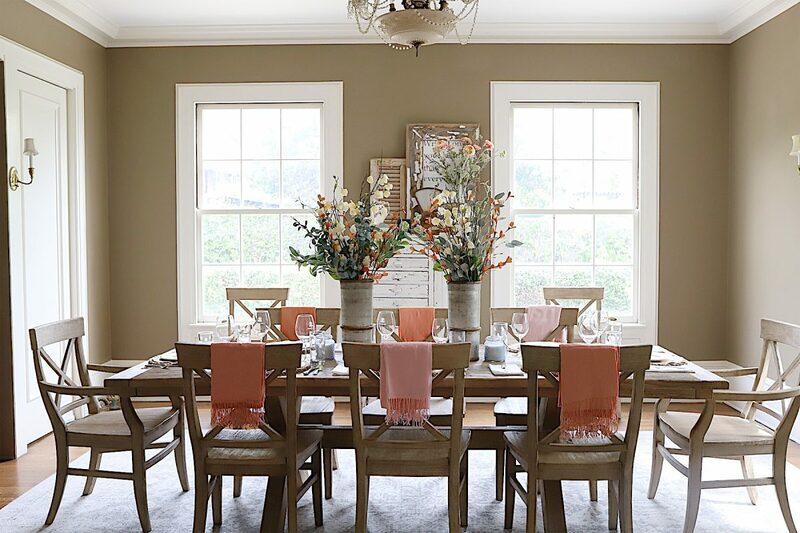 My neutral palette in the dining room is a perfect template to add color. I know my painted walls are a bit daring, but I love them. 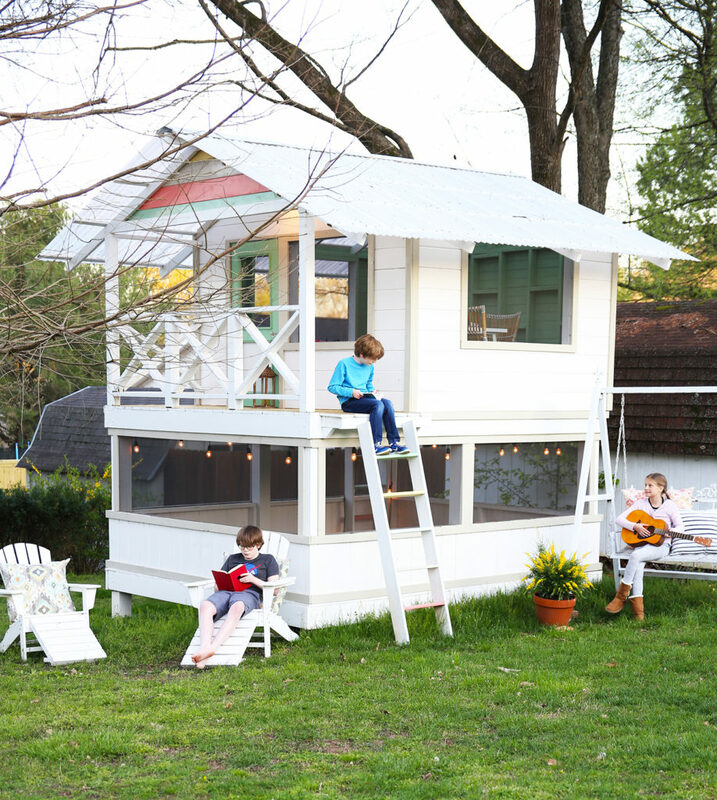 You can find all of my paint colors here. 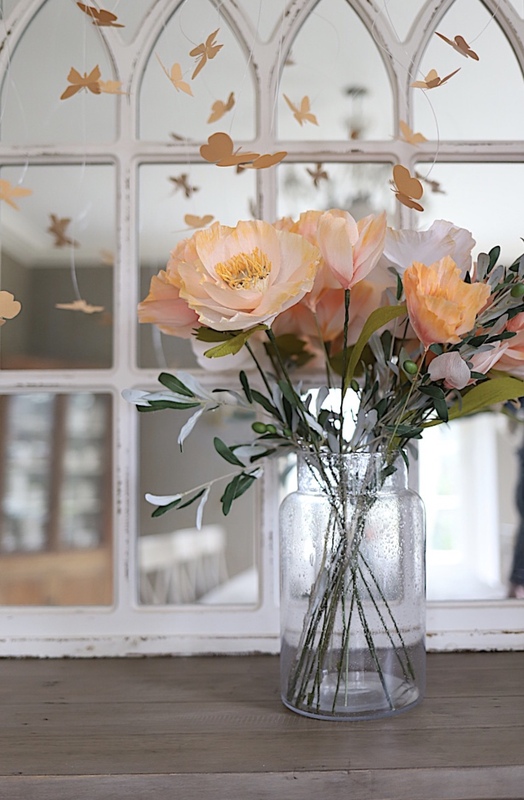 Usually, I have fresh flowers in my seasonal decor, but I thought it might be fun to show you how easy it is to add color with faux flowers. 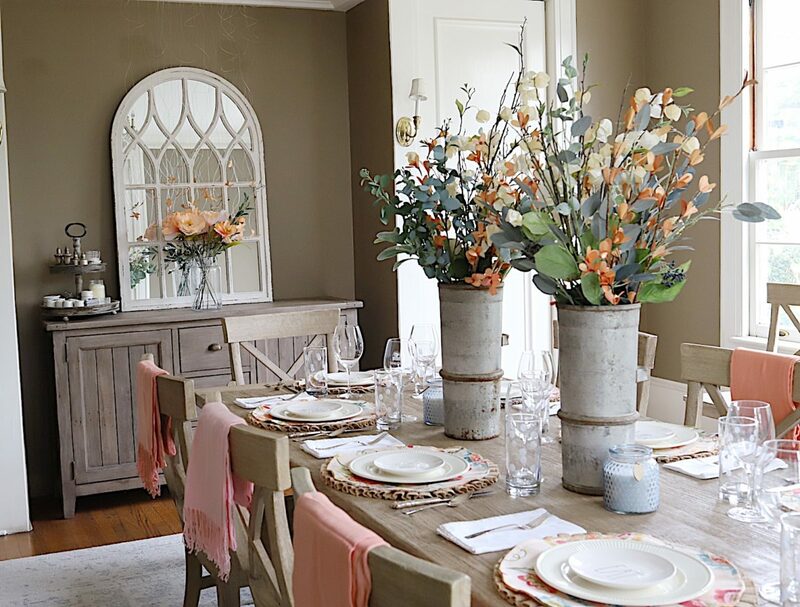 The flowers on the dining table are from JOANN and I used flea market cheese molds as the vases. The flowers on the buffet are handmade and they are made from crepe paper. I wanted to add a festive touch so I cut butterflies on my Cricut machine and attached them to fishing line with a hot glue gun. 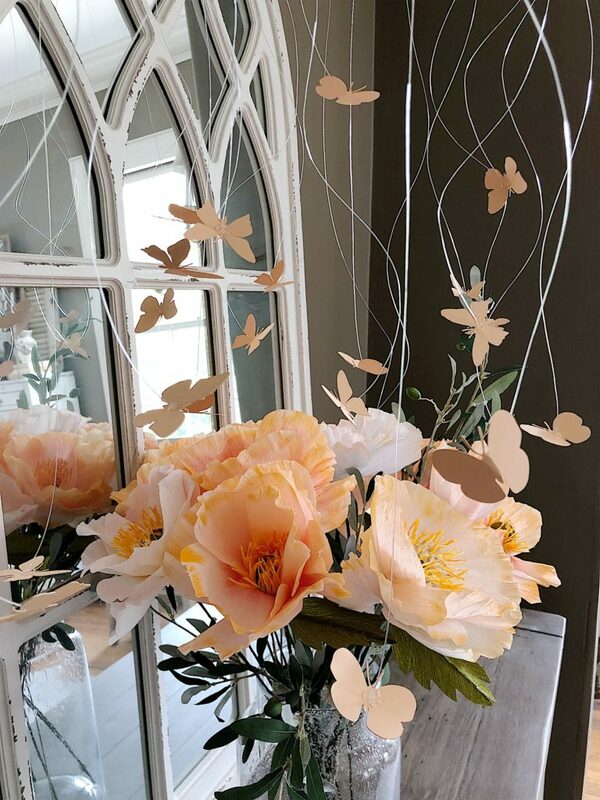 I am making butterflies for a bridal shower this weekend so I will share the complete DIY next week. Plus I will be making hundreds of them! 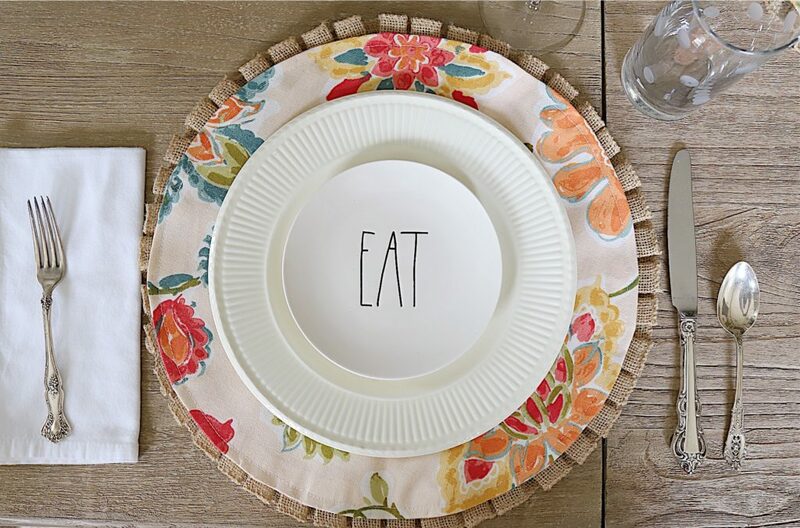 The placemats are from Pier 1 (and they are only $6!) but you can make them if you want too! Here is the post on how to make these burlap placemats. I have no idea why I own so many coral and orange pashmina shawls, but I thought they would add some color and provide a nice touch for my guests. Orange is a new color to me and I realized this morning I needed more color on my table. I searched my entire butler’s pantry but there was nothing bright and orange anywhere. I ran out to the fabric store, bought some decor fabric, and made these reversible placemats. And just so you know, I made eight placemats for about $25.00. 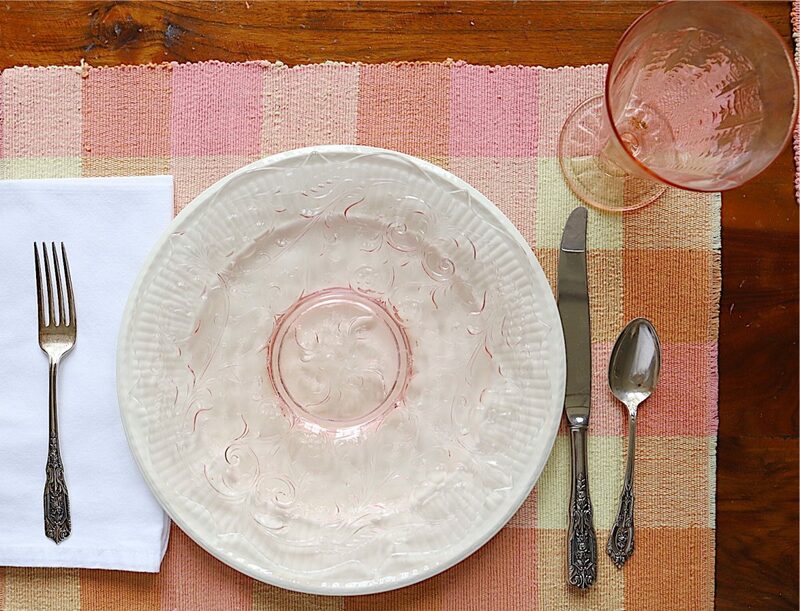 Fortunately, I have a previous blog post on how to make the placemats. 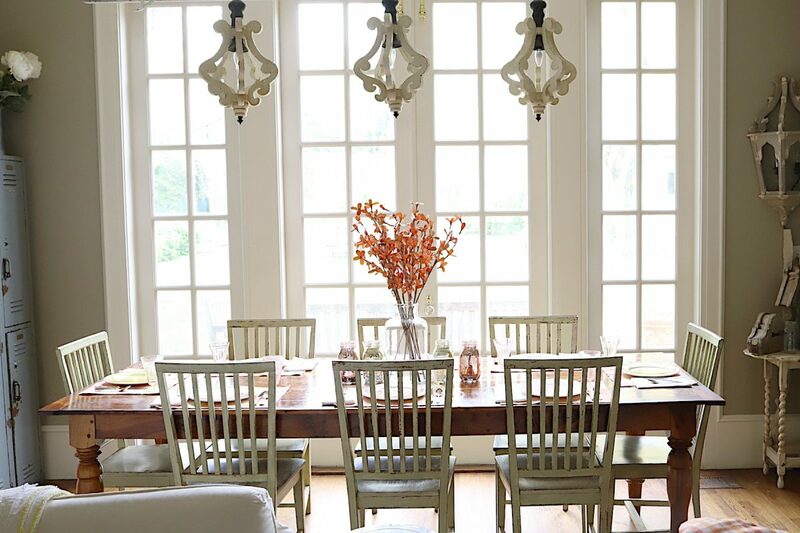 I love the look of my dining room! I love our family room but I have to be honest. It usually doesn’t look like this. There are always quilts covering the sectional, there are usually newspapers and books on the floor and there are always cozy blankets everywhere. This is real life and I don’t want you to think it is this perfect. Because it rarely is! This table is our family dining room table. 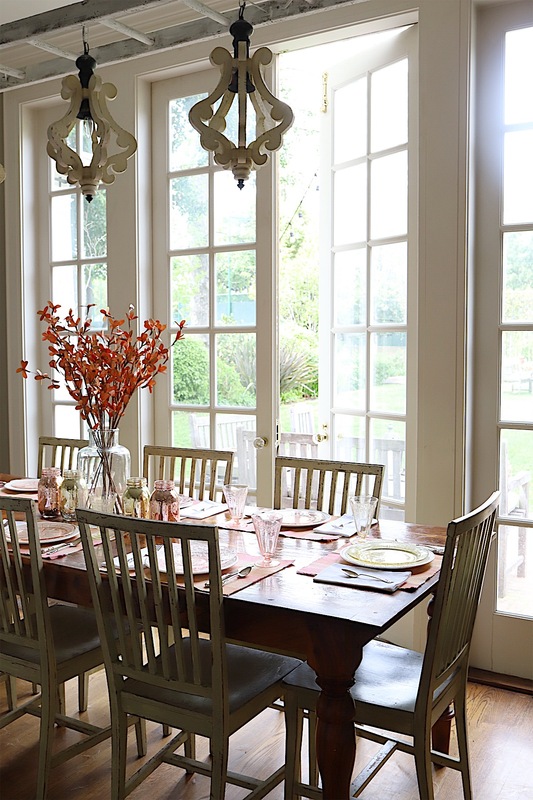 It’s where we eat breakfast and a lot of family dinners. Over twenty years ago I had this table made by a local carpenter. He used vintage wood. Dave thinks it might be Douglas Fir but I honestly don’t know! I set the table for a casual family dinner. 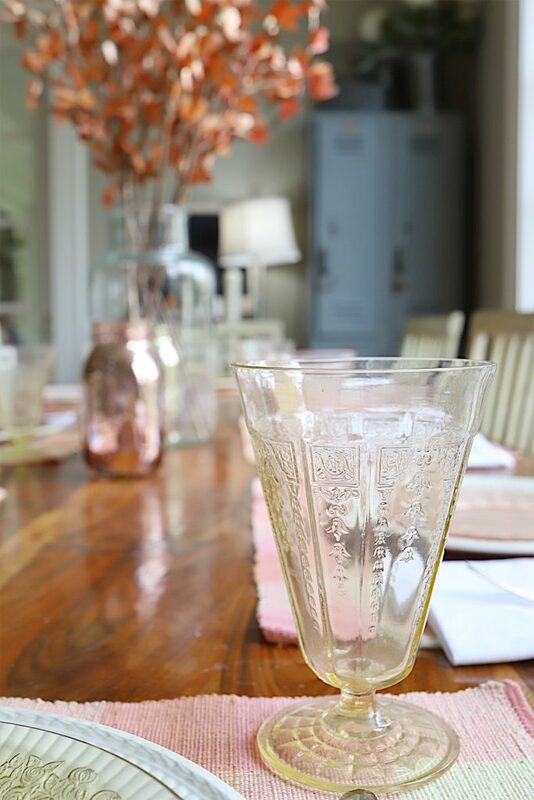 I pulled out some of my vintage Depression Glass goblets and plates. I use to collect these. Most of them were purchased at Brimfield, which is an amazing flea market show in Massachusetts. The funny part of the story is I carried home thirty pieces in my suitcase and carry on. And none of them broke! I also collect English Advertising pots and the flowers are also ones I made out of crepe paper. You can learn how to make the nail polish Easter eggs here. I found the colored mercury glass mason jars at JOANN. I really love the colors! 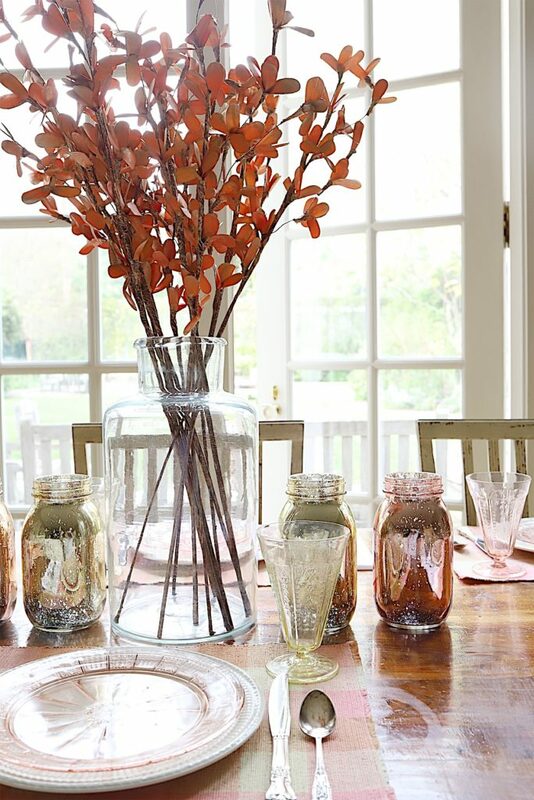 You can find the Gilded Orange Lily stems here. I have Depression Glass in pink, yellow and green. It’s delicate but doesn’t break too easily. The spring weather is getting warm so I love opening the french doors during dinner. All in all, I just love the orange accents in our home. I love spring decor and I hope you like it too. 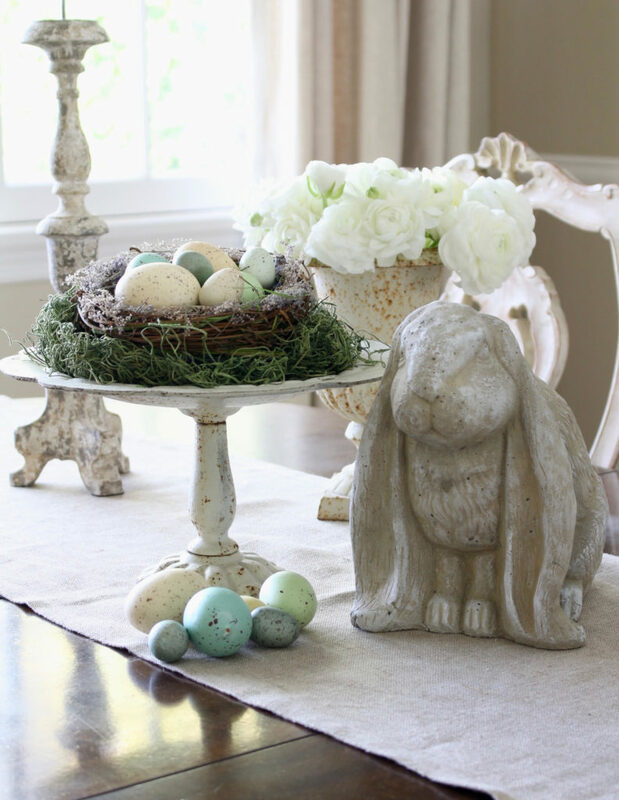 Today I have teamed with five other bloggers who are also sharing their Spring decor. Look how wonderful these are! 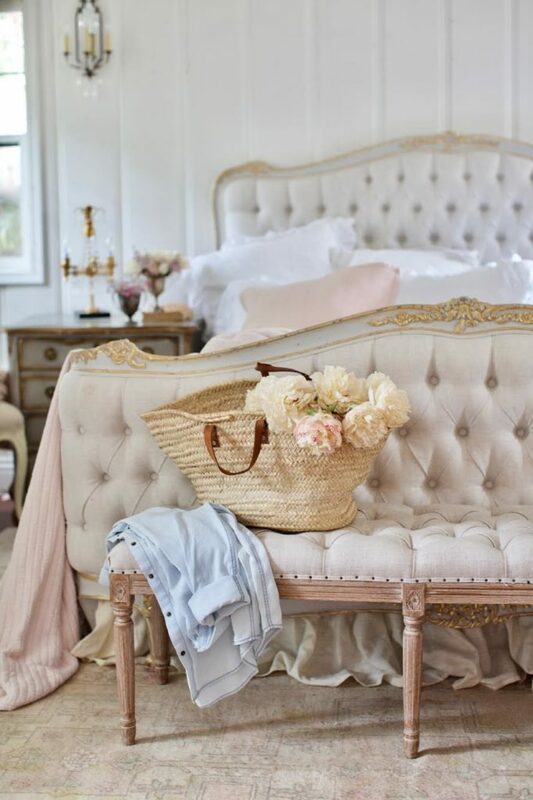 Sarah has the most gorgeous home and I love her neutral white palette. Nobody does blue as well as my friend KariAnne. 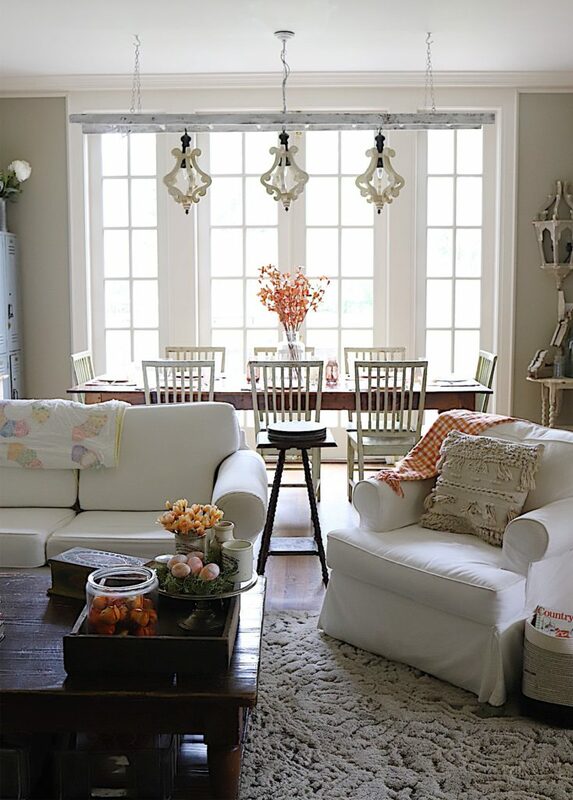 Her use of color in this room is amazing. 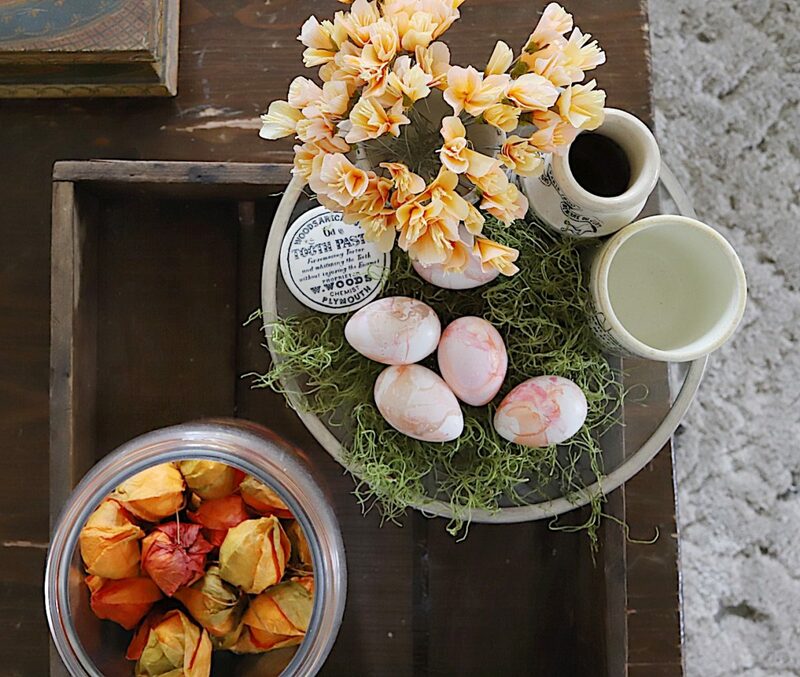 Sheila has put together the most perfect Easter decor. I love this. 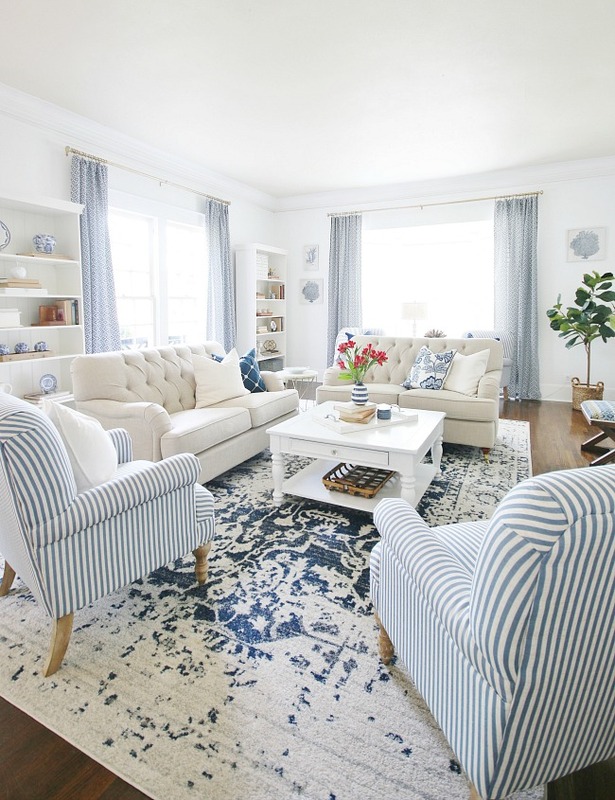 Ashley shares so many incredible changes they have made to her home. 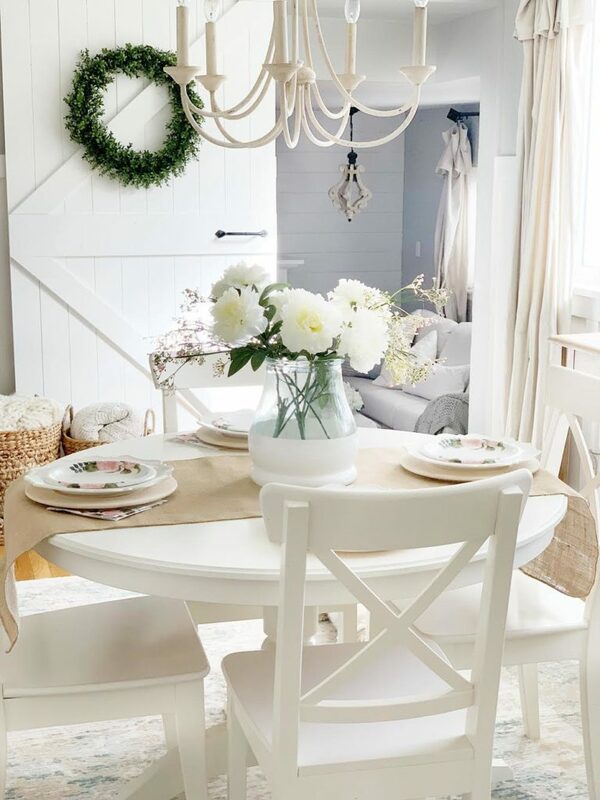 Courtney has done an incredible job of adding Spring decor to her gorgeous home! Thanks for joining me today for this really fun Spring tour. Leslie—your home is absolutely beautiful! I love those chairs in the dining room and those DOORS! So happy to be touring with you today! Seriously so beautiful and those butterflies! You are so incredible! 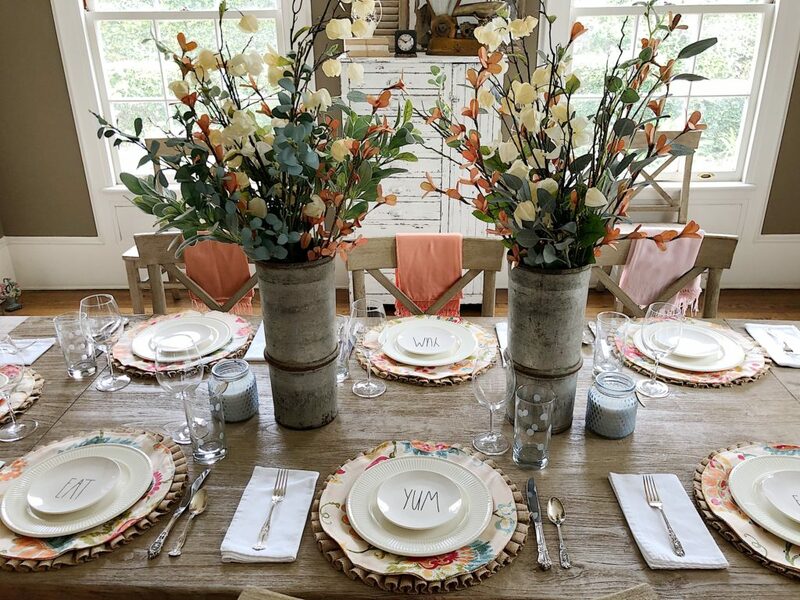 Your tablescape! Such unique colors and so much fun. Thank you so much for sharing with all of us!